Avascular necrosis (AVN) or osteonecrosis of the shoulder is one of the more common sites of presentation of AVN (the hip is first). Avascular Necrosis (AVN) is essentially a region of bone that has died as the result of loss of its blood supply. Without nutrition from the blood vasculature (oxygen and nutrients), the bone cannot survive. All these eponyms refer to descriptive words reflecting the nature of the problem. Avascular and ischemic, refer to loss of blood supply. 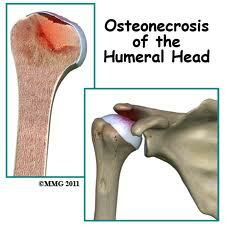 Osteo refers to bone. Necrosis or infarction, refers to the decay or cellular death that results from the loss of blood supply. The main blood supply to the bone of the shoulder (humerus) is the arcuate branch (intraosseous) off the humeral circumflex artery. A smaller contribution is from the posterior humeral circumflex artery. Disruption of these blood vessels may result in AVN. Symptoms of avascular necrosis (ischemic necrosis) may vary. initially shoulder pain may be gradual with no obvious history , especially in association with prolonged steroids (cortisone) usage. Loss of vasculature (avascular or ischemic) that results from trauma, such as humeral fractures may be more acute. 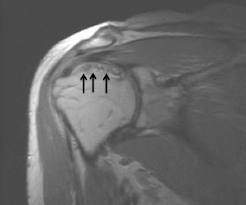 However, in the setting of trauma with surgery, a high index of suspicion should always be present in persistent shoulder pain. The diagnosis may be made on x-rays, however early or more accurate assessment may be made on MRI evaluation. If bone collapse occurs, joint involvement will result. Secondary arthritis may lead to advanced joint destruction. A classification system has been described for descriptive and perhaps prognosis with treatment by Creuss. Stage I Normal x-ray. 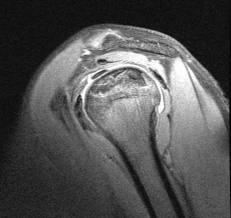 Changes seen on MRI. Stage II X-ray findings of sclerosis (wedged or mottled appearance) and osteopenia. Stage IV X-ray findings of flattening or collapse of the humerus bone. The normal repair process for the body and in ischemic necrosis (AVN) is to re-establish blood supply and then to repair the necrotic bone. Rest and conservative management have been advocated for early stages I or II. However, aggressive surgical opinions are not uncommon for all stages. Conservative approaches using Stem Cell Therapy have been successful. Interestingly, some invasive surgical procedures such as microfracture or core decompression are based on stem cells released into the necrosis area by diffusion from the bone marrow. There has been studies showing surgical decompression with the addition of the patients own stem cells by injection, is superior to microfracture (drilling) into the bone. All surgery is associated with significant downtime for recovery. Another option gaining popularity as it is more conservative, is to directly inject the patients own stem cells into the shoulder region of osteonecrosis (AVN). Stem Cell Injections for osteonecrosis (avascular necrosis ) has met with success in multiple different joints, Hip, knee, wrist, ankles, as well as the shoulder. The use of Regenerative Medicine therapies such as Stem Cell Therapy and Platelet Rich Plasma (PRP) for AVN has seen increasing use in the medical literature worldwide. Stem cells are integral to the normal healing process of bone and assist the body in repair efforts with AVN or osteonecrosis. In AVN, loss of blood supply to the region of necrosis hinders repair efforts. Additionally, with age there is a decline in available stem cells in the region to aid in the reparative or healing process. For this reason, assisting the body by directly supplementing the area of AVN with the patients own stem cells can aid in the repair process with AVN. It is possible to return blood flow to the ischemic area by forming a new blood supply, and then creating new bone cells to replace the necrotic ones. This process is exactly what mother nature intended stem cells to do: heal and repair. Avascular necrosis often needs helps to accomplish this. Platelet Rich Plasma (PRP) uses the patients concentrated blood to heal with growth factors. Dennis M. Lox, MD, has been consulted by patients and physicians worldwide on the use of Regenerative Medicine in treating AVN. A particular interest of Dr. Lox is the unique needs and treatment of athletes with AVN. Dr. Lox is a Sports Medicine and Regenerative Specialist in the Tampa Bay, Florida area and has treated athletes with AVN and sports medicine problems in multiple sports. Dr. Lox uses each patients individual goals and condition in order to plan treatment. Dr. Lox has experience with patients that did not respond to Platelet Rich Plasma (PRP) for AVN, that have responded to Stem Cell Therapy. This illustrates the individual needs of each patient must be assessed for proper treatment. Avoidance of precipitant events (trauma, steroids, alcohol) is important if pertinent for causation. athletes with avascular necrosis or sports medicine injuries click here.